View Poll Results: Will the world end tomorrow (10th Sept)? 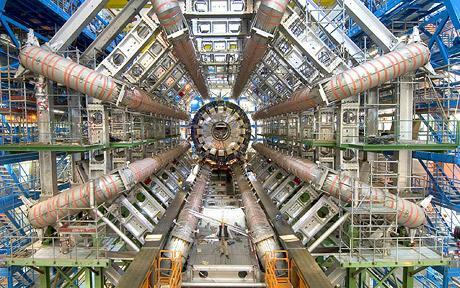 Will the world end tomorrow (10th Sept.) when the scientists fire up the 'CERN Atom Smasher' on the Swiss/French Border? "Critics of the Large Hadron Collider - a £4.4 billion machine due to be switched on on 10th Septemper - have lodged a lawsuit at the European Court for Human Rights against the 20 countries, including the UK, that fund the project. However, opponents fear the machine, which will smash pieces of atoms together at high speed and generate temperatures of more than a trillion degrees centigrade, may create a mini-black hole that could tear the earth apart." I'm gonna fess up - I'm not working very hard today, just in case. a £4.4 billion machine due to be switched on on 10th Septemper - have lodged a lawsuit at the European Court for Human Rights against the 20 countries, including the UK, that fund the project. Do we get our money back if the earth is destroyed? I would like to hope so Saxman.. £4.4 billion would buy a lot of stuff! wow and we wouldn't even get to use omnisphere, could some one mail them explaining what a great injustice that would be and at least wait till the 16th of september before ending the world??? If the world does end tomorrow then i wont get to see Doves on Friday or the soon to be Mercury Music Prize winners Elbow in October (both of which i have been waiting for years for). Can you put in your email as well Sureno? may create a mini-black hole that could tear the earth apart. The public concerns range from: (MBH) Blackholes, Expanded Quantum Wormholes (My favorite), Time-Distortions (second favorite), Strangelet Transitions (not likely), and let's not forget to mention, Complete Protonic Reversal! Even to this minute, the scientists are not sure about the potential outcomes! Stephen Hawking is unsure, in regard to 'Hawking Radiation', and it's affect upon the dissipation of (MBH) Blackholes! Well, I think we'll all be safe tomorrow, doing some additional reading, yes, they're flipping the standby switch tomorrow but the first particle collisions aren't happening until Oct 21st. Which puts me in a similar position to ndk, as I've got tickets to see M83 on Oct 22nd and I'd really like to be able to go that show.